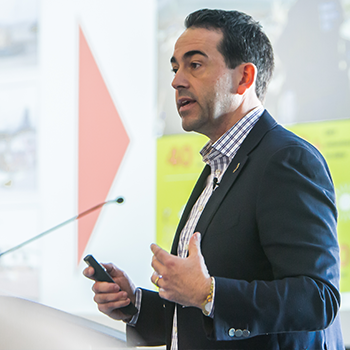 Andrew Williams, BBA ’96 and CEO of DHL Express Canada was the Lazaridis School’s most recent CEO-in-Residence on Nov. 23. Sharing his insights into the global logistics market with more than 100 guests, Andrew spoke about how effective supply chain management connects people and improves lives. The CEO-in-Residence is appointed by the dean of the Lazaridis School in recognition of the incredible difference they are making in the world of business. We look to those who lead their organizations with the qualities and characteristics of excellence that we seek to cultivate in our students; Andrew is one such leader. In the 22 years since he graduated from Laurier, Andrew has built his career with DHL Express working in more than 40 countries in roles that range from sales to operations and now as CEO. He supports a team of 1,651 employees in Canada who move more than 900,000 shipments per day. Working with DHL has fulfilled my childhood dream to see the world and make a difference. By integrating the cool things that DHL does with the way I want to live my life I’ve found the ultimate work/life integration. Andrew recognizes that businesses need more than just numbers to succeed. It takes purpose, love and hope that supports your employees, customers and communities in order to really thrive. DHL operates with the purpose that it is our duty to leave the earth in a better state, a purpose they live through a number of sustainability initiatives. These are not just nice thoughts on paper. DHL is actively working to reduce their carbon footprint by 50% by 2025 and to have a net-zero carbon footprint by 2050. Their emergency response team of more than 700 employees supports emergency relief efforts as supplies arrive to affected regions, providing their logistical expertise to ensure that important medical care and water are always on hand. As the Co-Chair of WE Day Canada, Andrew has had the opportunity to visit the communities supported through Me to We and to use his knowledge of international logistics to help build the Rafiki bracelet program worldwide. Through its initiatives, DHL engages its staff team at all levels because they truly understand that engaged team members engage customers, and companies with greater employee engagement grow 20% faster than those with employees who are unengaged. It is not so much a career ladder as it is a rock climbing exercise. You can never know too many languages or too many cultures. There is such a thing as being “fit to lead”. This includes renewal. Time passes fast. It’s not all about you. The best leaders are confident enough to hire people smarter and more capable than they are. “Strong opinions… weakly held.” Having an opinion matters. So does the ability to change it. Relationships and networks are critical. Embrace them. The session ended with a candid Q&A session addressing new trends in the global logistics market, as well as job readiness and how Laurier students can stand out. Andrew recommends showing a base understanding of the skills required for the job, and then showing how you have personally made a difference. Take responsibility for your own engagement and experience – both at school and in the workplace. "Laurier grads have a wonderful balance of technical skills and applied knowledge – from things like ICE week, in-class debates and opportunities to engage on campus, Laurier grads are different."